We added $210 to the Village Harvest on Souper Sunday! Title:We added $210 to the Village Harvest on Souper Sunday! 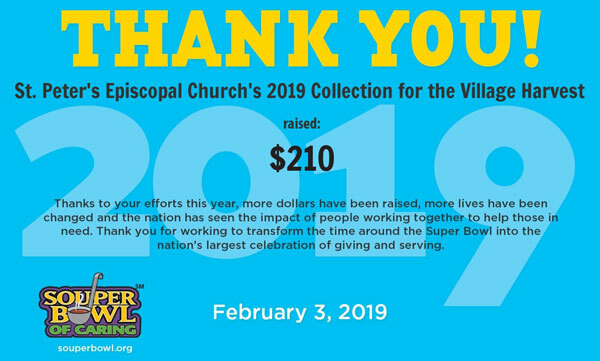 The Souper Bowl collection on Feb. 3, 2019 was a success attracting $210 compared to $175 and $125 for the previous two collections. We have been involved in the program since 2012 and we have collected $1.3K during that time. The Souper Bowl program in conjunction with the NBF focuses attention on the issues of hunger and poverty in our community and throughout the world. 149 million will tune into the big game but there are 50 million facing hunger. $210 goes to our monthly Village Harvest food distribution on the 3rd Wed. of each month. This year’s donation will cover 1.5 months of Village Harvest food purchased from the Happy Harvest Food Bank in Montross. Thanks to all who contributed and helped with this year’s collection!